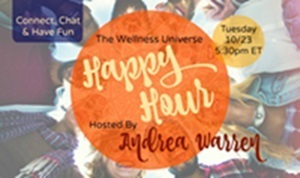 Join WU World-Changer Andrea Warren on Nov. 6th at 5:30 pm EST for Happy Hour, an online virtual gathering for WU World-Changers. Andrea will facilitate a new space for you to gather and kick back amongst your WU World-Changer community for a wonderful bot of 'self-time'. "My goal is to create a space where you can come as you are and take a BIG deep breath. We will meet bi-weekly and discuss what's top of mind; topics may range from spiritual healing techniques, books, recipes, our practices and more.